The Motorola DROID RAZR has only appeared in leaks and rumors, but it's a captivating device and now rumors claim to know its main highlights including the fact that it “will be faster than the iPhone 4S” and the thinnest LTE phone to date. 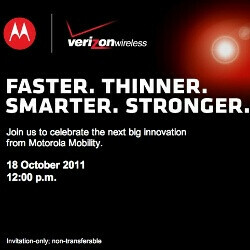 A video about a device unveiling coming October 18th was posted by Moto earler we have all reasons to believe it was about the RAZR. For once, a razor was showed in the video and some reinforced materials, which were previously said to be a feature of the new phone. How do you like what you see so far? Is it better than galaxy S2? why did you not start your account before they went to tiered pricing? Just preordered my iphone!! damn you! i want one in gsm!! You realize that LTE isnt CDMA right?? You mean GSM? They could release one in LTE flavored for GSM, AT&T's network is about to roll out some phones under their LTE network by the end of the year. No he means that LTE is a GSM technology that allows for faster network speeds, hence why you see SIM cards in all of Verizon's LTE phones. Im with hunter I also want one in gsm! Because some of us still go overseas and verizon has the saddest roaming agreements even in mexico. In mexico the only cdma carrier "iusacell"they which offered excelent coverage and verizon roamed of them in cdma mode is turning ALL of there cdma network gsm. I just got from mexico and my droud charge had service 10 percent of the time and yes I activated international roaming. Even major citys like mexico city and guadalajara offer little to no cdma coverage were just last year they had awesome cdma coverage. So yeaa it suckz. I know not everyone goes to mexico. But yea this phone would be nice if it worked in cdma, gsm and LTE. Cuz I do go to mexico a lot next time I go I will buy a cheap at&t go phone cuz at&t works 100 times better in mexico cuz my friend has the at&t Lg thrive on go phone and on mexico it roams on telcel and ahe even gets a 3G icon. Yup i'm pretty sure if this isn't the gsm for some reason, there will be a simultaneously released gsm version. Coz in my country(only gsm networks here), the company's local facebook page admins kept hinting towards this release. @ britney I agree with u verizon does have the saddest roaming agreements hopefully this phone is a world phone for those who travel can use it overseas heck if they did it with the bb storms why can't they do it with this one? O also I didn't kno at&t go phone offered mexico roaming? I tought it was only for postpaid customers? Correct me if I'm wrong. Becuz ima go to mexico next week and I have a thunderbolt which I confirmed its not gonna work in morelia mexico cuz like u said no cdma coverage there only gsm..
@fatgurl lol yea I recommend u get at&t go phone for use in mexico when roamin in mexico its just 25 cents to call back the US pretty cheap if u ask me. My frend got da LG thrive we live in LA so its a 2 hour drive to TJ. Our flight from tj to mexico city was at 7:30 in da morning so we got out da house at 4:30 when we were gettin close to da border my friend took out his phone and was all like dammit I forgot to activate roaming on it so its not gonna work. But to our surprise once we crossed it imediatley switched to telcel gsm at&t dissapeared off da screen. And telcel mexico kicked in and everything worked the same calling , txtin, data etc..
i dont want in any network, i want to buy a new phone to my brother in India. it doesn't mean you can use it on other GSM networks for talk/data. the radio only uses Verizon's LTE signal bands. Interesting, the Razr and Nexus getting introduced only 10 hours apart. It's a good time to have Verizon... and an upgrade in my pocket. I'd have to admit, the droid razr's specs would be only ever-so-slightly better than the SGS2's, which was released in my country back in June. The Nexus Prime, however, demonstrates quite a leap, not only in hardware, but also in software. My question... will it have gorilla glass? A lot of HTC phones sadly do not have Gorilla Glass. All of Motorola and Samsung's high end phones have it however. No Apple products have Gorilla Glass. And last time I checked they were supposed to be "cutting edge" products with the best of the best and all. That is because no Apple products are high end smartphones.